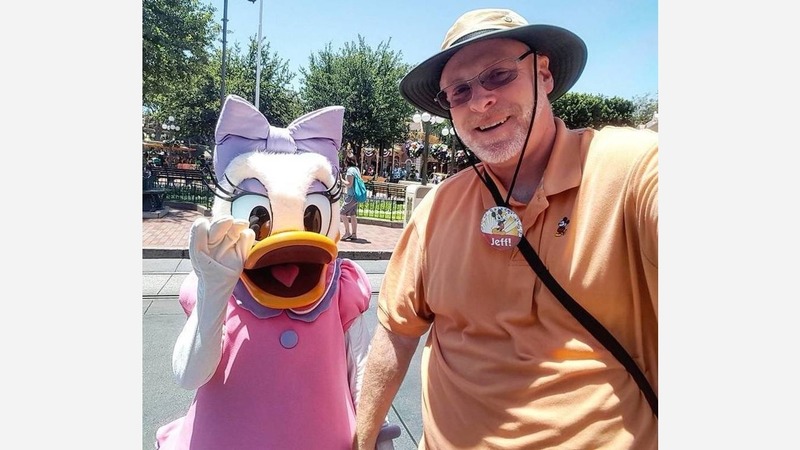 ANAHEIM, Calif. -- Huntington Beach resident and Air Force veteran Jeff Reitz marked a milestone of super hero proportions at the Disneyland Resort in Southern California. On Thursday morning, he walked through the turnstiles for the 2,000th consecutive day. He started his Happiest Journey on January 1, 2012. When Reitz, a Disneyland Resort annual passholder, began his daily visits to the Disneyland Resort in 2012, the resort was preparing to welcome the exciting new Cars Land in Disney California Adventure park, which opened that summer. This month, he's visiting the resort during Summer of Heroes, a celebration highlighted by super hero encounters and the new Guardians of the Galaxy Mission: BREAKOUT! attraction in Disney California Adventure. Reitz said he's already experienced that new adventure more than a dozen times. Reitz, an Air Force veteran, credits the parks with giving him something to look forward to each day, noting that he enjoys hearing the music as he enters, interacting with the friendly park cast members, and watching the park guests having a good time. He also enjoys the shows and attractions, including one of his favorites, the Matterhorn Bobsleds adventure. Reitz says he plans to continue treating himself to daily park visits for as long as he can.